You probably think that because I write about airguns that I don't shoot firearms. Well, actually, I grew up interested in firearms and only casually associated with airguns because they happened to be around. As a teenager, I had a subscription to American Rifleman, Guns & Ammo and Firearms News and read Elmer Keith, P.O. Ackley and the writers they venerated, such as Townsend Whelen. I understood external ballistics at a time when most boys my age were memorizing ball scores. I had help developing my love of guns. My mother signed me up for an NRA firearms familiarization course that lasted three weeks. She also forbid me to have a BB gun, so naturally they became the object of my young passion. And, then, something changed. I'm not quite sure what it was. Perhaps, I was older, perhaps, because we moved to a larger place in the country, things became freer. All I know is that the shackles came off and my gun-owning days began — and almost ended! My first firearm was a Remington 551 autoloader that I hated. My next one was a Colt Army Special in .38 Special! It was my grandfather's service revolver when he had been a local constable. I learned to shoot centerfire handguns from that gentle relic; and from then on, I owned and traded guns like a professional, but that's a different story. Through it all, I owned a couple airguns, but nothing very interesting. At the time, I felt that airguns were beneath me. They weren't firearms, after all! I worked my way through college as a hired gun. Deputy Marshal of Frontier Village. I'm in the white hat! In college, I worked at Frontier Village, a western-themed amusement park in San Jose, California, where I was a ride operator, a picnic manager and finally a deputy marshal. That got me into the gunfights we had every hour on the hour, and that, in turn, started me reloading. We all shot Colt .45 single-actions in the gunfights. A couple of us tried other guns before we gave up and bought our Colts. In the beginning, I shot a Great Western in .38 Special, so I had to reload my own blanks, while the outlaw, Dakota, shot a Hawes single-action for a while. But, those guns had reliability problems that the Colts never had, so we finally bit the bullet and bought our Colts. Dakota bought a Gen 2 cavalry model, and I bought a Gen 1 artillery model. Eventually, I had it rebarrelled with the longer 7.5-inch barrel and life was good. Pellet guns were not in the picture during this period but Vietnam was, and I was in ROTC. So in June 1970, I went off to my Officer's Basic course at Fort Knox. From then on, I was a tanker and shot just about everything the Army had. I got my fill of the puny M16 quick enough, and there was enough full-auto shooting of individual and crew-served weapons to complete my rock-and-roll dance card for all time. But in 1976, the light switch was tripped. While stationed in Germany with the First Armored Division, I was on a sightseeing trip to the historic walled city of Rothenburg when I turned the corner and stumbled into a gun store! In Germany! This was the first German gun store I had ever seen, even though I had been in country for a couple of years. This Diana model 10 air pistol changed my life and defined my future, though I didn't know it at the time. The store owner saw my interest in fine guns and showed me a Walther LGR target rifle. He told me it was an airgun, which completely blew me away. It was so big and heavy and right! Such a rifle spoke volumes about accuracy and pride of ownership. I wanted it so much! But, the price that worked out to over $400 was too much for a family man.However, all was not lost. He also had a cased Diana model 10 target pistol that was quite nice. It was much cheaper, and I got out the door with that pistol, a steel target trap and 5,000 RWS Meisterkugeln wadcutter pellets for $218. From that point on, I shot firearms for a living and airguns for recreation. The rest of the time I was in Germany, I shot that pistol in our tiny apartment with the steel pellet trap hanging on our steel-sheathed front door. I had exactly 19 feet of distance to use and no one could be home when I shot. Coincidently with this purchase, Robert Beeman was well into getting his company started, and he wrote and edited the first volume of Airgun Digest. I immediately sent for his color catalogs, which I read and memorized. They built up such a desire to own a real Beeman airgun that when I returned home to California in late 1977, the first thing I did was drive up over the Golden Gate Bridge to the Beeman store in Santa Rosa, where I bought the icon air rifle of the '70s — a Feinwerkbau 124. It would be several years before I became aware that the German city in which I had been stationed for four years, Erlangen, was home to the BSF airgun company and I had lived literally a stone's throw from the mother lode of precision adult airguns. Never mind that — I now owned a real Beeman! But, my joy was incomplete. I now had the epitome of fine airguns, both rifle and pistol, but as far as I knew, I was alone on the planet. I still had trading tables at the gun shows where I would see the occasional Crosman or Benjamin from time to time, but there was no real information about airguns. There were no books, no magazines to pore over. The few airgun articles that made their way into firearms magazines were vague and lacking in detail. Gun writers back then (and now) knew little about airguns, it seems. Robert Beeman (left) founder of Beeman Precision Airguns, speaks with a relative of Captain Clark of the Lewis & Clark Expedition to discover more about the airgun they carried. In 1991, the clouds parted and a ray of sunshine beamed down in the form of a U.S. magazine about airguns. 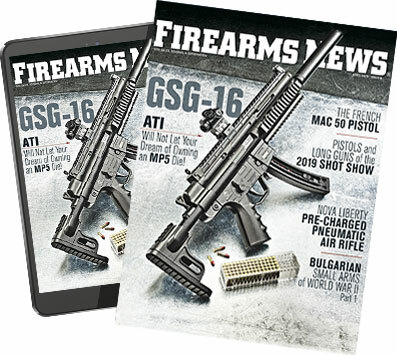 It was titled U.S. Airguns, and you had to know it was subscriber-only, because it wasn't carried on any newsstand. I subscribed immediately and thought my joy was complete. And, it was, until the third quarterly issue failed to arrive. I called the subscription number and a pleasant lady assured me it would be there any day. I'm still waiting for that day. To say I was in a funk would trivialize the dark cloud that settled over my head. I was beside myself with anguish. Finally, my wife, who could stand it no longer, asked me why I didn't start a magazine of my own. That was absurd, I thought. What do I know about airguns? I would be out of material before finishing the first issue. She challenged me to write the titles of some articles I thought I could write from what I knew, and by the time I finished filling the third sheet of a legal tablet I knew I could do it. All that reading as a youngster, added to all my shooting experience as an adult added up to one huge non-accredited credential as a shooting sports enthusiast. We decided to write a monthly newsletter instead of a whole magazine, because it was more in keeping with our two separate full-time jobs. The first issue went out in March 1994. Over time, the full-time jobs went away, leaving just The Airgun Letter and an occasional Airgun Revue magazine. There was a brief interlude with a national newsstand magazine called Airgun Illustrated, but it flopped after a few issues. However, in 2001, the editor of Shotgun News, now Firearms News, Bob Hunnicutt, asked me to write some feature articles for him. Naturally, most of those were about airguns, but he also allowed me the occasional foray into firearms if the subject was interesting. I began an association that has blossomed into a solid relationship. So solid that when Airgun Illustrated magazine went south in 2003, I was able to shift gears and pick up this column that was so thoughtfully and graciously extended. At the same time, I had been writing the occasional internet article for my friend, Josh Ungier, for his Pyramyd Air website. In 2005, Josh asked me to write a full-time daily blog about airguns for his site. That began in March of that year and is still going strong. All this writing has driven me to test a wide range of airguns and to expand my horizons to the entire airgun industry. I started attending the SHOT Show in 1996 and began to meet the manufacturers and the owners who make the airgun industry go. Men like Dieter AnschÃ¼tz and Hans Weihrauch, Jr., and Robert Beeman come to these shows and will sometimes talk at length about the drama behind the scenes. Listening to them is an education that money can't buy. Writing also leads to a bushel and a peck of shooting. While I may bust a couple thousand caps each year shooting firearms, I launch well over 25,000 pellets and BBs in the same timeframe. I shoot something almost every day, which you can easily do with airguns. That number doesn't take into account the airsoft BBs I also shoot, because airsoft is part of my beat, as well. I'm shooting all the time. If you live in Alaska or certain parts of the West, I'm sure you can walk outside and shoot firearms all you want, but guys like me have to load up the truck with gear and drive to the range, where we can shoot for a while if we're lucky. I augment that with an occasional splash at the local indoor range, when I just have to smell burned power or go mad. As I glance around my office right now, I see 19 air rifles and seven air pistols standing by, ready to go into action in an instant. Two bullet traps await the whim. Several hundred more guns are within 20 steps, in a bedroom that is now called "The Gun Room." It should be obvious why I shoot airguns. I shoot them because I like them, and because they have become part of my life. A life that is supported entirely by the shooting sports.